In 1906, Westport got a library. It was a gift from Morris Jesup. A successful businessman, whose money came from selling railroad supplies, he endowed the building on on the Post Road (then called State Street), near Main Street. The cornerstone was laid in 1906. Michael Calise, Daine Silfen, Matt Murray. Michael Brennecke, Stephanie Ehrman, Rosalie Kaye, Lawrence Zlatin, Janice Strizever, Robert Mitchell, Bobbie Herman, Eva Lopez Reyman, Jonathan McClure, Seth Goltzer and Dede Fitch all recognized Lynn U. Miller’s image. To see last week’s photo challenge, click here. The library grew, expanded west, then took over the 2nd floor. In 1986 it had outgrown its original home, and moved across the street, past Jesup Road and up the hill, to landfill that had once been the town dump. The old library is home now to (among others) HSBC Bank, Starbucks and Freshii. Today, the library is in the midst of another transformation. But none of it would have been possible without Jesup’s philanthropy. The Westport Library was not Jesup’s only gift. He was a major benefactor of the American Museum of Natural History. He also commissioned a 5-year anthropological expedition to Alaska and Siberia. The northernmost piece of land in the world, at the tip of Greenland, is named Cape Morris Jesup. In 1908 — just before he died — he donated his old home as a parsonage for the Saugatuck Congregational Church. This week’s photo challenge comes from Molly Alger. 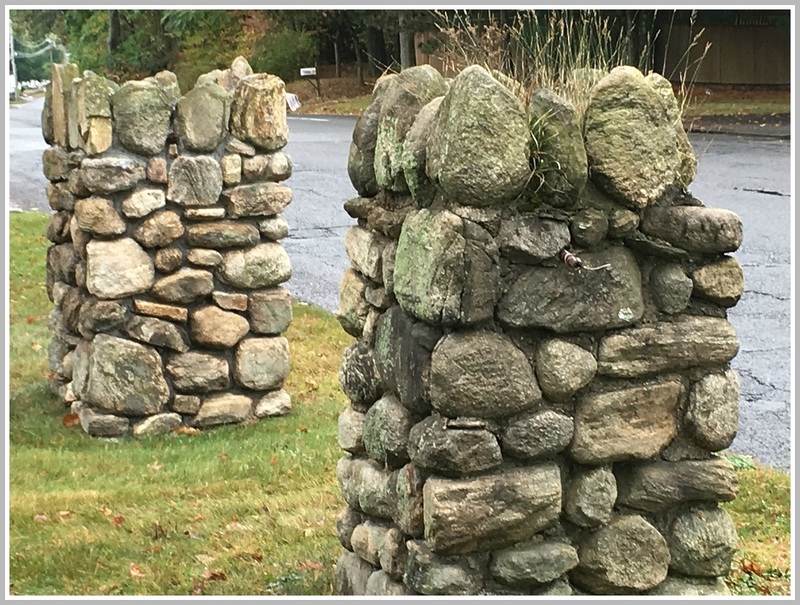 If you know where in Westport you’d find this Stonehenge-like formation, click “Comments” below. This entry was posted in Library, Photo Challenge and tagged Morris Jesup, Westport Library. Bookmark the permalink. That corporate office park on Post Road West – left hand side if you’re headed to Norwalk just past the intersection of Kings Highway South? Stonybrook road near intersection with Winding lane? Morley is correct Post Rd West (US RT 1) Office Park. Coming from Norwalk the pillars will be on the right across from Marion Rd. Reverse that coming from Westport on Post Rd West (US RT 1) toward Norwalk Kings Highway South will be on the left the Office Park then the pillars with Marion Rd will be on the right. That office park was once a house I believe. I just don’t have a memory of the house. It might have been set off the road. Pillars like that were known as decorative survey markers. In this case possibly an entrance or right of way to the property. The property was probably a lot larger. It was probably divided up sold as lots in the 1970’s. That’s when the office park was built in 1978 or 1979. I remember it being this new glimming glass building. Yes, Morley is correct. And as usual, Wendy fills in the all the blanks, with wonderful back stories. Check out the pillars the next time you’re on Post Road West — but drive safely! Morley The Renzulli Family owns property on Westport (Post Rd West) and Norwalk (Westport Ave) borders. Renzulli Rd is on Westport Ave (US RT 1) same side as the pillars the street runs thru to Kings Highway South. This might help looking into local directories and land records. Thanks, Wendy! I’ll try to remember to ask Ricky the next time I see him. Morley, my mother found this site years ago. I do believe you, Dan and others will find this intriguing to help with your back looking back into history. Since starts in 1934 and moves forward through the years. I also typed ‘1934 aerial map of Westport, CT’ or ‘1934 aerial map of 06880’. She said to type this into your search engine ‘CT1934_05302’ it will bring to this area above. Thanks so much Wendy – those aerials are like a secret key to the past, why didn’t I think of that? get onto the Post Rd every day and never noticed the pillars!!!!! Near Westport Historical Soc., or near Ft. Apachiie/Willows,or near Willowbrook Cem. It looked very familiar, but I couldn’t exactly place it…just guessed. I lived on Marion Rd. for 15 years!! At first glance I thought they were an attempt at a Cotswold–type stone design, with mortar. What’s that conduit (if that’s what it is) near the top? A gate or fence? I’ve always wondered why there were two random stone pillars there. Maybe a past old driveway to the building but then I thought maybe there was a house there at one point. You can also type ‘1934 aerial photography Westport, CT’ into your search engine. I forgot to mention in Morley reply also type this into your search engine ‘1952 aerial photography Westport, CT’. It looks they like they did aerial photography every 10 years or so. For exact location of above site type this into your search engine ‘CT1934_05302’. My mother found these sites. Very cool. You can see the original driveway and house in 1934. 😊👌💜Jackpot! I told my mother “Morley would love this site of aerial photography!” I’m glad I forwarded this to you and for others (if interested). You’re always researching houses, landmarks and bridges along with the other Wendy C (Crowther? I believe?) and the historical society. You can look all over Connecticut with these aerial photopgraphy sites.